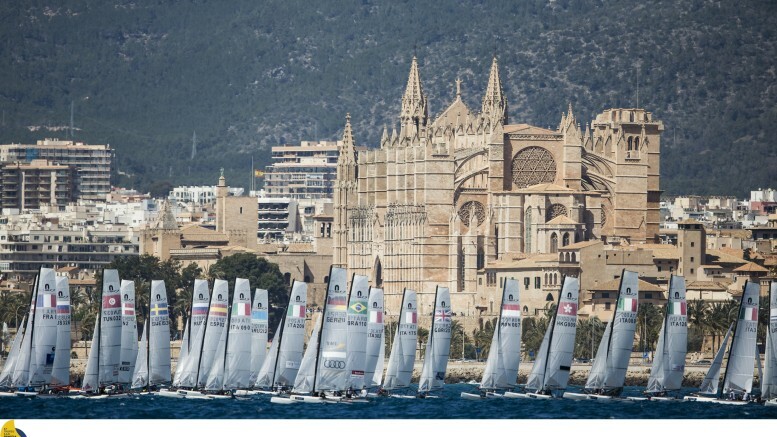 Mallorca Report: If Day 1 of the Trofeo Princesa Sofia IBEROSTAR proved a close to perfect, straighforward boatspeed day in moderately brisk breezes, Tuesday’s races were much more about being in the right place, in the best pressure for more of the time. And so while there a small posse of top sailors who returned a perfect scoreline on the opening day, such consistency was much, much more difficult to achieve today. The Men’s 470 Class, racing first on their course area, arguably got the better breeze, finishing Races 3 and 4 of their Qualifying Series before the pressure started to ease slightly in the afternoon. But in every class today there was little which immediately obvious. Witness the Finn Class where World Champion Giles Scott had a tough day, amassing 56 points across the two races. Able to discard the 45th – making the wrong choices, but not the 11th, Scott lies second now to NZL’s Josh Junior. Further evidence? On the Nacra17 course the irrepressible French pair Billy Besson and Marie Riou ‘only’ had a sputtering 7,8 start to their day before posting their fourth race win to ensure they still comfortably lead the 37 boat class. Despite the short postponement this morning the regatta schedule is pretty much on course. Three races were sailed for the 49ers, RS:X and Nacra 17s while the other classes completed two. Austria’s Nico Delle Karth and Nikolaus Resch had the 49er fleet with Spain’s young guns Diego Botin and Iago Lopez second. Gold medallists Nathan Outteridge and Iain Jensen hit their straps with wins in Races 5 and 6, elevating them to sixth overall. In the FX Class Denmark’s Miami silver medallists Jena Mai Hansen and Katja Steen Salskov-Iversen lead.